This article explains how to create an automatically backup for an Oracle schema. This is a response for a friend request. Create a backup of your Oracle database. To create an Oracle backup, I know two tools first rman and the second tool is expdp. In this article, I will use the tool expdp and I will export the HR schema, and If you want to know how to export database or table, look at this url (10g, 11gr1). Connect with sys user to grant user privilege and to create a directory for the backup. 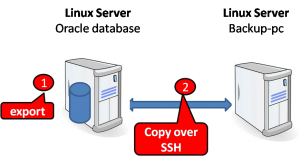 After the export, it is time to copy the backup to another host (backup-pc) and to secure the copy over Ethernet I will use a ssh tunnel and also to create an automatically backup (using crond), I will create a connection using the public/private key. Create a public/private rsa key. Create the ssh folder if not exist. For example, I created a user named backup on my backup server. Second solution: create every time a new copy of the export file, also i recommend you to create backup file with a specific name containing the date of the backup for example. If you want to execute the backup every day you can use the crontab (example at 20:00 from Monday to Friday). I hope that this article can solve your problem.